Money, money, money. DFS is all about it. How much does a player cost? How much is the entry fee? How much is the rake? How much can we win? How much can we lose? It’s all about the money. Salary is all about the money, match ups are all about the money, and sportsbooks are most definitely all about the money. We spend it to build with it and try to win it. Tracking salary and price changes are just one part of the DFS puzzle I consider each week. On our DraftKings and FanDuel salary pages we provide salary, projections, ranks, and value factors each week. These can easily be imported into a spreadsheet for your own research. Below are links to both of our salary pages. As well as links to our optimizers. 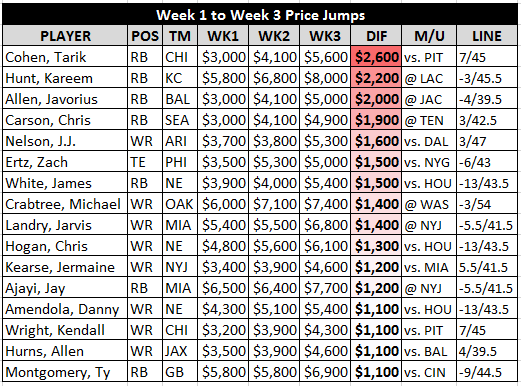 I play predominantly on DraftKings (sorry, kickers!) and the values discussed in this article reflect DraftKings pricing. The following chart consists of the top ten price increases in salary since Week 1, with quick hits on players I am looking at this week. •	Tarik Cohen may have seen the largest price jump of any player, but at $5,600 he is still low priced when you compare him to Jay Ajayi, Ty Montgomery, and Kareem Hunt. Jordan Howard is dinged up and the Chicago Bears are home dogs by seven points this week. Fire him up. •	Javorius Allen at $5,000 is a running back value that may be impossible to ignore. Terrance West is expected to play this week, but at this point Allen is moonlighting as the Baltimore Ravens’ WR2. •	Michael Crabtree’s cost is officially out of control after a three touchdown effort against the New York Jets last week. Still, at $7,400 he is cheaper than teammate Amari Cooper and I will be looking for lineups to squeeze him into. •	James White, Chris Hogan, and Danny Amendola all have increases this week due to their cake matchup against the Houston Texans. In a game where they are favored by 13 points with a low total of 43.5, I am avoiding all of them. •	Jay Ajayi at $7,700 and Ty Montgomery at $6,900 figure to be the chalk running backs this week. I prefer the cheaper option in Montgomery before he gets over that $7,000 mark (likely next week). 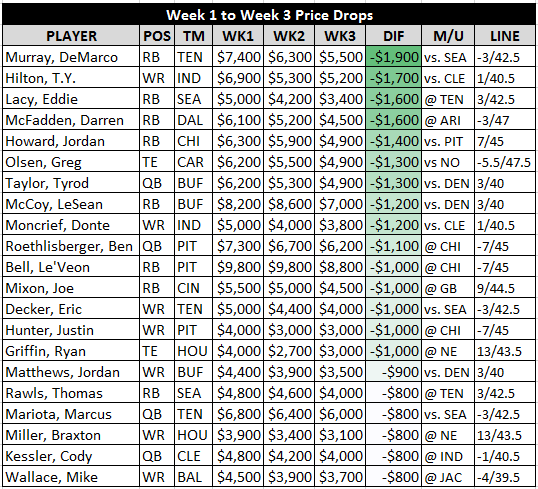 •	Of all the price increase plays this week Zach Ertz is the one I am looking to have the most exposure to. He has gone from $3,500 in Week 1 to $5,000 this week, which is an increase but he curiously costs less than he did in Week 2. The Eagles host the New York Giants this weekend, who struggled in Week 1 against Jason Witten (7/59/1) and Week 2 against Eric Ebron (5/42/1). On the opposite side of the pay up spectrum lies players whose salaries have seen a price drop. •	DeMarco Murray is down $1,900 from his Week 1 salary and costs $5,500 this week. The last time he was this cheap was in Week 1 of the 2016 season ($5,300). Murray is dinged up but he practiced today and it will be nearly impossible for me not to have a decent amount of exposure to him this week if looks likely to play. •	LeSean McCoy is down to $7,000 after the Denver Broncos stuffed Ezekiel Elliott last week. This feels like a bit of an overreaction on the salary makers’ part and is something to consider exploiting when constructing rosters this weekend. •	If we buy into Ben Roethlisberger’s home and road splits then we can see why a few Steelers are on sale this week. I’m not buying into it that much and will happily take Le’Veon Bell at a full $1,000 less than his Week 1 and Week 2 salary. •	Eric Decker ($4,000) and Marcus Mariota ($6,000) figure to be low owned this week on the road against the Seattle Seahawks. The 3 point spread implies a close game. This contrarian stack would eat up just 20% of your salary cap. Decker is seeing over 20% of the team’s targets and 67% of the red zone targets. Mariota has thrown one touchdown this season. Regression is imminent and could come this week against the Seahawks defense. They allowed Jordy Nelson and Randall Cobb to combine for 16 receptions, 164 yards and a score last week. Did I mention Corey Davis is out this week? The money is one piece of the complex DFS puzzle. Salary fluctuation is one factor I look at and try to exploit. The match ups and sportsbook lines guide the process as well. When diving into research and finalizing your lineups this weekend make sure you use our salaries and optimizer pages, as well as read our many daily fantasy articles, to your advantage. Feel free to reach out to me on Twitter @FFdeJENerate for any salary change questions. Good luck!